Koulsy Lamko (1959) is a writer and university lecturer from Chad. In 1979 he fled his native country because of the civil war and settled down in Burkina Faso. There he worked among other things in community theatre. After a residence in Rwanda he published the novel La phalène des collines. At the moment he stays, as a guest of Amsterdam Vluchtstad, in the former apartment of Anne Frank and her family at the Amsterdam Merwedeplein. What with the creationists and the evolutionists, prejudice decidedly still has a lot of life left in it. An intriguing question, the origin of man! As part of its tricentenary celebrations, from January to May 2009 the Teylers Museum in Haarlem is hosting 'Exotic Man: Other Cultures as Entertainment'. The exhibition, which brings together posters, photographs, masks, colonial objects, sculptures, documentaries, books, etc. in a formal post-modern perspective, boldly returns to the theme of the perception of Otherness as promulgated for centuries in Europe. 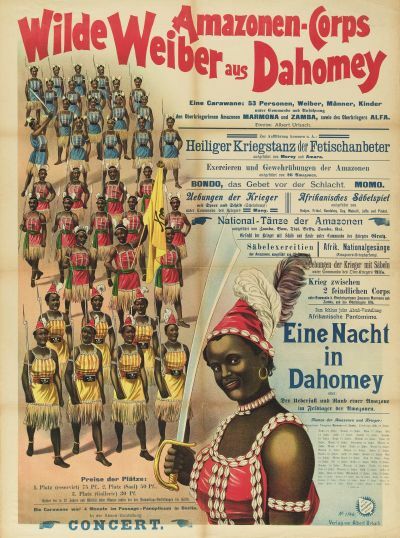 Tribes of Africans, Indians, Aboriginees, Greenlanders, Samoans and Pakistanis, huts, forests, temples, slavery, the 1897 Colonial Exhibition in Tervuren, scientific expeditions, craniometry, anthropometry, the Hottentot Venus, the colour chart, DNA – in a word, biology, culture and history – are cheerfully jumbled together, revealing the commonalities on which racism, slavery, colonisation and apartheid were founded. In a nutshell, Others, because they are different, are animals, or almost: they are in a state of nature, ugly, bizarre, comic, savage, violent, devoid of reason, cannibals – in a word, for all these reasons, exotic! What is the purpose of such a daring exhibition on this sensitive subject? The answer is complex. To hold up a mirror, to confront us with our own history? The aim of educating and reminding us is undoubtedly laudable. Indeed, if it invites us to look twice, in other words to examine the unhealthy, hierarchical, destructive attitude to Others, if it leads us to question the stupidity of pseudo-scientific attempts at racial characterisation and hierarchal organisation, if it elicits from visitors not an amused smile (short of an unusual capacity for self-ridicule) but a grimace of disgust, we can feel reassured. Conversely, if, instead of being perceived as a scathing denunciation, the exhibition confirms visitors in their stereotypes, it would be monstrous. There is nothing against being entertained, but because of the multiple meanings that images can have, a good deal of care is called for in the way objects are presented (in this case a unilateral point of view, lifeless legends, heterogeneity, etc.) – especially when conjuring up the muddy swamp where human thought has become bogged down in justifying atrocities. It is not so long since the colonial era when, by dint of imposing rules and measuring legs and noses, the social categories Tutsi and Hutu were transformed into rival ethnic groups, thus laying the foundation for the genocide of the Tutsis in Rwanda. James Watson’s racist arguments are still current. There is still a danger of being drawn into a progression: "you become a scientific profile, a negroid type, an anthropological debate, a photographic subject".